Utada Hikaru or also known as Hikki has just release a single called Heart Station/Stay Gold. 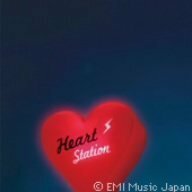 Heart Station is another great song and workpiece by her. Not only that , her another song is also great (stay song) . Overall heart station song is better than stay gold but i personally like stay gold’s pv than heart station. This entry was posted in Music, Utada Hikaru and tagged Heart Station, Heart Station single, Heart station.mp3, Heart Station/Stay Gold single, Hikki, Stay gold, Stay Gold single, Stay Gold.mp3, Utada Hikaru, Utada Hikaru - Heart Station, Utada Hikaru - Stay Gold, Utada Hikaru single by mofandom. Bookmark the permalink.